While there are constantly new television shows debuting with claims that they'll be loved by children as well as their parents, we all know that finding a true gem that fits that description isn't always that easy to do. Fortunately for us, one series that has kept my girls (as well as me) riveted to the screen has been the magical world of Enchancia starring Sofia the First. One of Disney Junior's newer characters, Sofia the First features the storybook world of Princess Sofia, an adventurous little girl who is learning how to adjust to royal life after her mom marries the king and she becomes a princess overnight. Sofia quickly discovers that looking like a princess isn't all that difficult, but possessing the characteristics of a true princess – honesty, loyalty, courage, independence, compassion and grace – is what makes one truly royal. I love that each episode of Sofia the First includes great messaging about things like friendship, being yourself, keeping your promises, caring, sharing and more, while still being fully entertaining enough that we are thrilled to tune in time and time again. 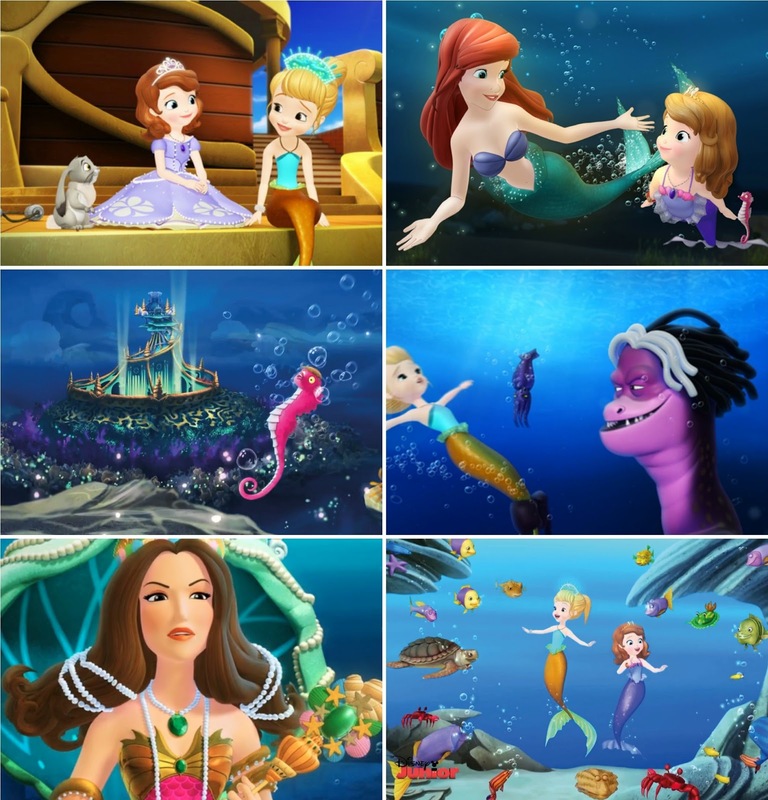 Which is why we were even more excited when we found out that we would be able to watch four of our favorite magical and majestic Sofia adventures with today's release of Sofia the First: The Floating Palace. 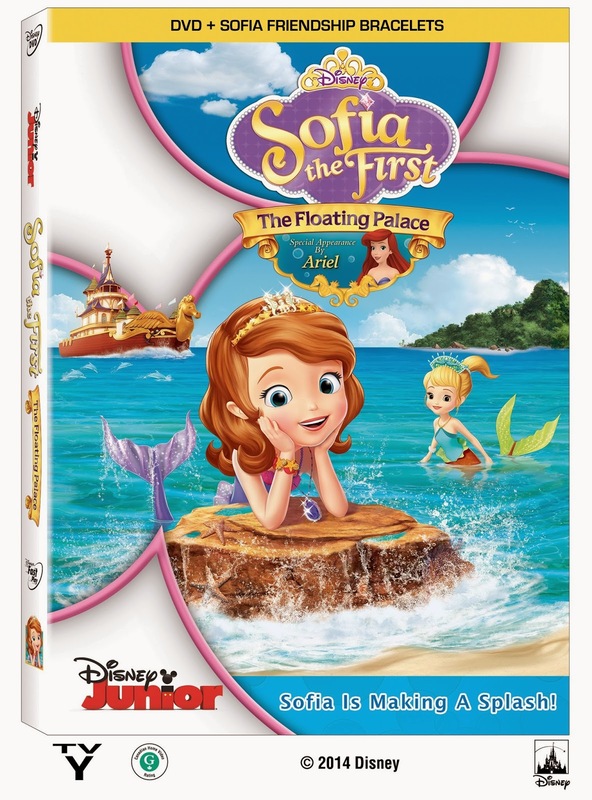 The perfect addition to any Sofia the First fan's Easter basket, this DVD includes a full-length underwater mermaid adventure as well as three bonus episodes and two friendship bracelets. 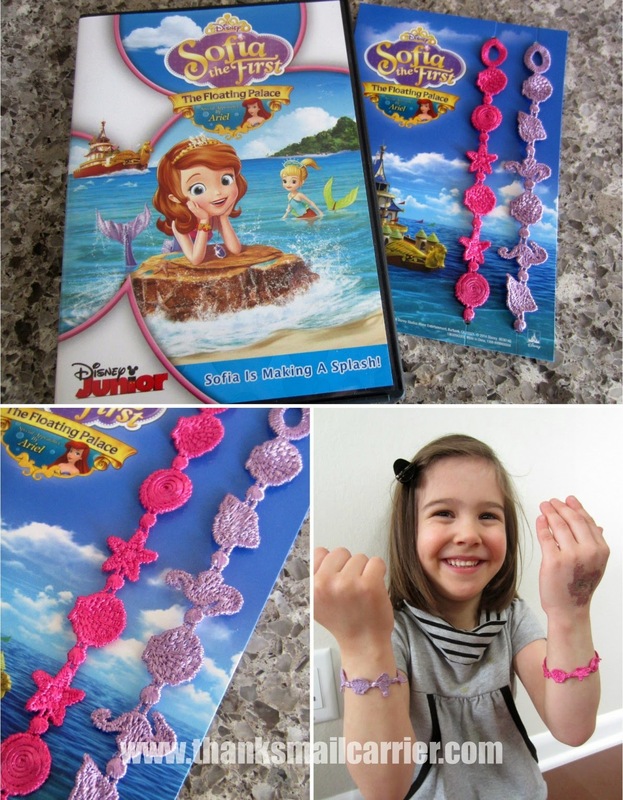 When Little Sister B realized that she was not only going to get to see Sofia transform into a mermaid to help save her new friends from danger but that she would get to wear adorable bracelets as well? That just increased the excitement tenfold! After she had her new jewelry in place, it took all of two minutes before we had this DVD in the player and began to see Sofia making waves and exploring the water. Originally aired in November of 2013, The Floating Palace is filled with song-filled fun and adventure that proves that when families and friends work together, they can weather any storm and save the day. After Sofia helps a young mermaid named Oona, Sofia's magic amulet grants her the power to transform into a mermaid and visit her new friend's secret underwater kingdom. But when Cedric (disguised as a sea monster) plots to steal Oona's enchanted Mermaid Comb, danger surfaces for both worlds. With a little help from special guest, Princess Ariel, Sofia embarks on an adventure to rescue Oona. I love that this episode has its own incredible message and that my girls can visit an enchanted underwater kingdom while they cheer Sofia on. Yet, when the high-flying adventure veers off course (as it tends to do in Sofia the First), there are always special guests like Princess Ariel that come to the rescue with inspiring advice about trying new things, staying strong, asking for help and trusting yourself. I couldn't have said it better myself or picked more valuable lessons! If you're ready to get in on the fun and excitement (and positive messages) of Sofia the First, head over to the Disney Junior website to find out more about all of the ways you and your child can interact with this young princess and pick up Sofia the First: The Floating Palace today. Other than the copy of Sofia the First: The Floating Palace that I was provided by Disney Junior, I was not compensated or enticed to do this post in any way. This review is solely my honest opinion of this product. Thank you for your review. I am sure that my niece would love this. I don't know how this Disney movie go by me. My niece will love "Sophia The First." Thanks for the review. Sofia the First looks like a great children's series, definitely worth watching. Leave it to Disney to come up with something like this, I think the DVD is a great investment. Thank you for sharing this review. I don't have any kids in my life right now that would like this. Looks like a good series. thanks for the review. not sure if it will be the right thing for the nephews. It looks cute. I am sure my niece would love this! Our daughter would enjoy watching this. Something about mermaids she loves? my niece loves Sophia the 1st! DVDs keep coming up with tie-in presents like the bracelets. Looks like a big hit. This is such a cute DVD with a good story that my niece would love to see. I like the colorful characters and this is a good birthday present to give to my niece! Such a cute thing to watch. Those bracelets are adorable.